According to the Associated Press, the WV Lottery Commission will take over administration of West Virginia's nationally recognized gambling hotline and counseling network on July 1st. 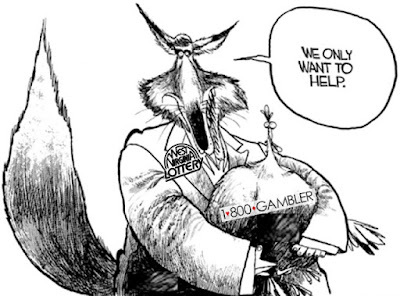 The move will take responsibility for the program, which provides counseling for problem gamblers and their families, away from state public health officials and place it with the lottery commission at the same time that the lottery is expected to begin operating casino-style table games at multiple locations in the state. Wow, doesn't that sound like a GREAT idea?! This move is so dumb, I almost think it's a ruse so that lawmakers can intervene to "save" the gamblers hotline in hopes of reducing the animosity they face from gambling opponents in next year's election. "We can help you with your gambling habit. You can bet on it!" Ha! And the games people play"
And never saying what they mean"
Hmmm... "never saying what they mean"? I wonder why they cut that particular line? That couldn't happen in our fair capitol city could it?